After his ship Endurance was crushed by Antarctic ice and now trapped on a small inhospitable island, cut off from all hope of help, with winter approaching, Sir Ernest Shackleton made the fateful decision to attempt a risky, almost foolhardy voyage across the wild Southern Ocean to South Georgia with five of his men. From there, he would attempt to trek over unmapped and treacherous glaciers to reach safety. Neither journey had ever been attempted before. Showing the courage and leadership which would become synonymous with his name, Shackleton prevailed, and returned to rescue the entire crew of his ill-fated ship. His feat was dubbed the greatest survival journey of all time. Using the same equipment as Shackleton, eating the same food, sailing a replica of the small, keel-less boat, author, explorer and environmental scientist Tim Jarvis led a six-man crew in an attempt to recreate Shackleton’s epic journey for the first time. A veteran of Antarctica’s frozen wastes, Tim found himself facing his greatest challenge yet — a never ending struggle against conditions which fought him all the way. 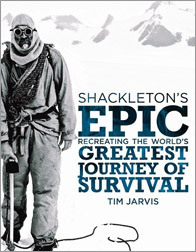 Shackleton’s Epic tells the stories of these two expeditions, separated by nearly one hundred years, but unified by the struggle to survive the timeless savagery of the Southern Hemisphere.